The romantic slideshow templates for SmartSHOW 3D software presented in this video will help you create a heartfelt gift for the one you love. A music slideshow featuring your happiest moments together will make an enchanting surprise for your anniversary, St.Valentine's Day, or just a romantic night in. This beautiful stylepack can become a perfect base for a wedding slideshow, too! Created by professional designers, the romantic slideshow templates are a tasteful blend of pastel colors, floral motifs, and shiny embellishments. And that's just what you see at first glance! The creative potential of SmartSHOW 3D slideshow maker was employed to bring still pictures to life. A selection of intricate animation effects and artistic photo filters gives each photo a special look - watch the demo video to see how it works! Can't wait to start creating your own love story movie? Here's how you go about it: add the romantic slideshow templates into your SmartSHOW 3D software, open the folder with your cherished photos and insert them into the frames, choose the music track to accompany the slideshow, and enjoy the result! Now, all is left to do is to convert your project to video or burn it to DVD. 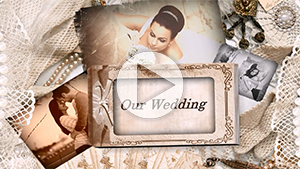 It's up to you to decide if you will watch the slideshow together in the comfort of your home or play it at your wedding reception or anniversary celebration. If you need some advice or assistance while working on your video, drop a note to our support team - they'll be happy to help.